FERRIS WHEEL THE STARBURST W/ADAPTER # 64489. Exterior multi color lighting surrounds and illuminates ferris wheel. 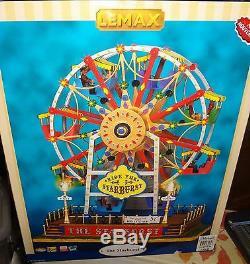 Ferris wheel revoles in counterclockwise direction. ON /OFF switch with volume control. Size: (H x W x D). 12 x 10 5/8 x 6 3/4 inches. 31.8 x 27.0 x 17.0 cm. 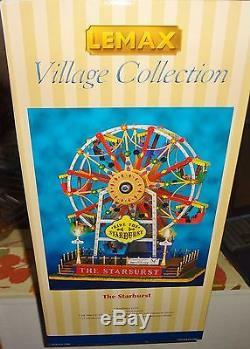 LEMAX VILLAGE COLLECTION FERRIS WHEEL THE STARBURST W/ADAPTER # 64489 NIB. The Piece was retired in 2016, very detailed, Lighted & Animated. 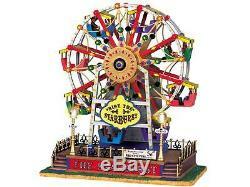 Ferris Wheel goes arond in counter clockwise motion. These will be listed over the next 6 months to a year. I have a lot of items. Unless prior arrangements are made. 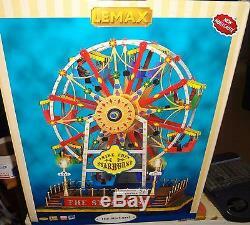 The item "LEMAX VILLAGE COLLECTION FERRIS WHEEL THE STARBURST WithADAPTER # 64489 NIB" is in sale since Saturday, April 01, 2017. This item is in the category "Collectibles\Holiday & Seasonal\Christmas\ Current (1991-Now)\Villages & Houses". The seller is "fc201" and is located in Littleton, Colorado. This item can be shipped to United States.